Gigabyte is reportedly set to cut personnel and marketing budgets in 2019 following slipping motherboard shipments and wider market decline. According to market watchers close to the matter, the massive component brand will be axing 5-10% of its staff to combat a downturn in the overall motherboard and graphics card markets. The company’s board shipments fell by approximately 1.15 million from 2017 to 2018 – amounting to a grand total of 11.45 million units last year. That’s massively down on the 16 million units the company managed to get out the door in 2016, and this market weakness is expected to be affecting the likes of Asus and MSI, too – who are reportedly cutting expenses to combat the revenue shortfall. 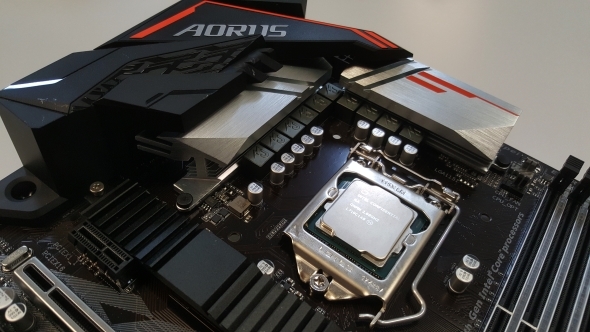 But it’s not just motherboards that are reportedly slipping in recent months. If Nvidia bearing all to its investors recently wasn’t a clear enough sign of a troubled graphics card market, Gigabyte’s GPU shipments have also fallen severely back down to 2016 levels – that’s pre-mining boom, which went supernova in 2017. In a letter to investors, Nvidia CEO, Jen-Hsun Huang, recently admitted that sales were slower than expected for its latest high-end Turing graphics cards. Also the company is still facing challenges ridding itself of excess mid-range inventory left in the channel now that cryptocurrency revenue has gone kaput. That’s no good for team green, but let’s spare a moment for the graphics card manufacturers that are left in a tight spot, too. Sources familiar with the matter (speaking with DigiTimes) believe that Gigabyte’s motherboard business will be targeted by layoffs rather than the GPU side of the business – despite both running into the harsh market conditions and the shockwaves of the crypto-crash as of late. Let’s hope those affected find their feet swiftly. Gigabyte has refused to comment to DigiTimes regarding the rumours, but the company is expected to focus on maintaining motherboard shipments above 10 million units in 2019. And if Nvidia’s outlook for the next quarter is anything to go on, GPU shipments won’t be much to write home about anytime soon, either. At least there’s a heap of new product on the way to pull component manufacturers out of the danger zone. AMD Navi, a major mainstream GPU release; 3rd Gen Ryzen; Intel Ice Lake; and Nvidia’s rumoured GTX 1660 Ti mainstream competitor are all set for launch sometime this year, ready to swoop in and save the day.